Our Story. It Can Be Yours, Too! I grew up in sunny South America where my brothers and I spent every free minute outdoors, and I’m so grateful to my parents for being aware of the importance of sun protection. 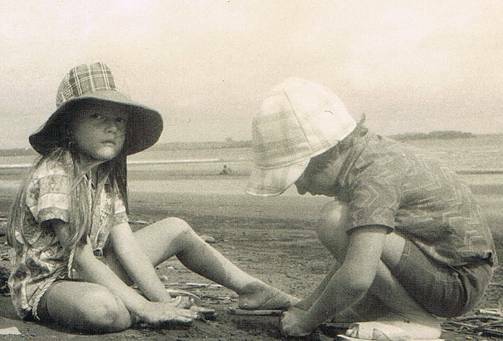 They made sure that we always wore a hat and a plain white t-shirt at the beach or in the pool to protect us from the harmful rays of the sun. This simple measure protected us effectively at that time. We were free to play outdoors to our heart’s content and embrace the sun without worries. My parents’ lessons about sun protection made a lasting impression with me, especially as I became a Mom. Through Ami Sol, I am thrilled to pass on second generation knowledge in the hope that parents and children of today and our future will benefit greatly. With the birth of my first child, my awareness of sun protection took on even more importance, so I immersed myself in rigorous research on the latest statistics and findings. I discovered that much has changed since the time of my childhood. Skin cancer statistics are staggering and reach into practically every family. Beyond that, what current industry offers us as sun protection is laden with harmful chemicals. The impact on the human body from these chemicals is often worse than the disease these products are supposed to prevent. What a double bind! My dedication to research continued. It became obvious to me that what harms us, harms our planet, and vice versa. Out of my abiding care and concern for the health and well-being of our planet and its people, especially our children, I felt a vital need to share my knowledge and awareness with other parents. I became inspired to open new avenues for us to be in relationship with the Sun in healthy ways, so I founded Ami Sol. Wearing hats made by my mom! A blend of French and Spanish, the name fits our company perfectly! We at Ami Sol are a blend of friendly people from different cultures who came together to create a business that brings style and sun safety without added chemicals and toxins. Effectively protecting our little ones has become more challenging, but it can be done simply, stylishly and naturally, as our site illustrates. Our motto at Ami Sol is “Embrace The Sun Safely”. 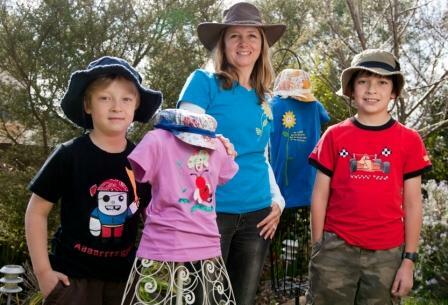 Our mission is to educate parents on the latest findings in NATURAL sun protection as well as environmental protection. Our goal here at Ami Sol is to provide comfortable, stylish clothing that allows children to play in the sunshine, absorbing healthy vitamin D, without suffering the effects of harmful UV rays. Our clothing exceeds rigorous Australian and New Zealand standards 4399 of UVB and UVA protection. Our garments are completely free of chemical sun-protection treatments. Our sun protection comes from natural fibers only. And better yet, our cotton is organic! I invite you to visit Ami Sol often. You will find this site to be a source of consistently updated information, as well as an expanding line of natural sun-protective products. Ami Sol is a small, family-owned company who are passionate in sharing our knowledge and experience with you. We proudly provide you with the highest level of product and personalized customer service because WE CARE! As a customer, you are part of the Ami Sol family. Please enjoy our website and be sure to share your stories with us on our blog!